Once again comics are in the news and, once again with monotonous predictability, it's the right-of-centre papers that are exaggerating another story into "political correctness gone mad". 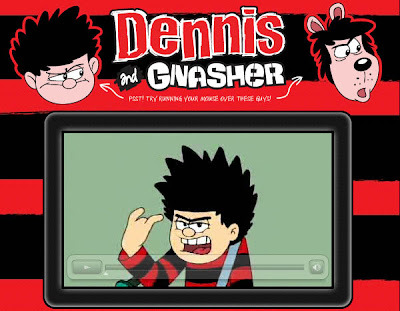 This time the subject is the new Dennis and Gnasher cartoon series which starts on CBBC on September 7th. 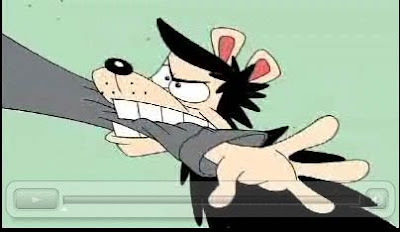 The Sun revved up its readers into purple faced rage on August 12th with an article entitled "Dennis De-Menaced" which claimed that for the new cartoon the BBC have "banned" catapults from the tv show, that Dennis would no longer be slippered by his Dad, and "even his dog Gnasher has been targeted. 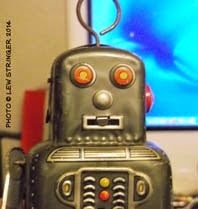 He will no longer sink his teeth in people or engage in his trademark wanton destruction". The Sun's story followed a traditional psychological redtop technique: printing alleged political correct quotes from anonymous "insiders" and "sources" to get their readers revved up, then a counter-claim from a named source at the end of the article. But by the the time the readers have reached the final quote they've already absorbed the myth and the red mist has descended. This news was picked up by other sources, including The Daily Telegraph, Daily Mail, Digital Spy, and right-wing organizations such as the loathsome National Front, all seeing the story as another indication that Britain had gone to the dogs. And their readers believed them. "One of the best characters from my youth - destroyed!" stated a contributor to The Sun's forum, whilst another declared "this p.c stuff is going mad and must be stopped!!! soon we wont be able to breathe without it being either racist or bad for children!!" If only any of these half-wits had bothered checking their sources before falling for another myth they'd have seen a different story. For a start, corporal punishment isn't in the cartoon because it hasn't been used in the comic for a generation! Hardly the fault of the BBC if society moves on. As for the other complaints, if The Sun's readers had looked at the CBBC Dennis and Gnasher website instead of being played for fools they may have noticed a few things in the trailer which crush the myths outright. "Gnasher... will no longer sink his teeth in people".... WRONG! 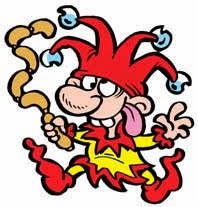 "They have banned The Beano's bully from using his trusty catapult" - WRONG! 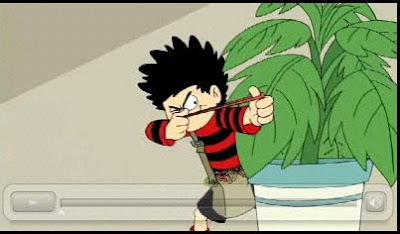 Some papers even claimed Dennis was no longer a "menace", despite the Dennis and Gnasher website describing him as "the Number One menace in Beanotown". Today The Daily Telegraph moved the panic-mongering up a notch by quoting the daughters of the late Davy Law (Dennis the Menace's original artist) as saying their father would have been "horrified by the transformation". This is exactly the same technique The Daily Mail used two years ago when it wrongly claimed Desperate Dan was being toned down, quoting Dudley Watkins' daughter as saying her father would have been "horrified". Quite a distasteful practice to involve the families of the artists in this way in my opinion. The way in which the national press can so easily and rapidly manipulate their readers with disinformation is quite disturbing. Yes, the "new" Dennis does look different to the way he was in the 1950s, but what these media reports ignore is that any changes have happened gradually over the past 50 years, not overnight by the BBC as they suggest. But if they admitted that they wouldn't have a story to pad out the pages of their bulging papers, and they wouldn't be achieving their usual remit - winding up "Little Englanders" into such a beetroot-faced apoplexy that they feel the right-of-centre papers are their only comfort zone. Of course there have been some changes made for the transition to tv, but they mainly seem to be cosmetic ones for the new art style. The Beano will be reflecting any changes in style from the issue on sale this Wednesday. 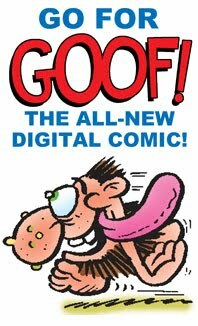 The Dennis and Gnasher strip expands to four pages (drawn this week by Nigel Parkinson) and a souvenir booklet about the new tv cartoon is one of the free gifts. 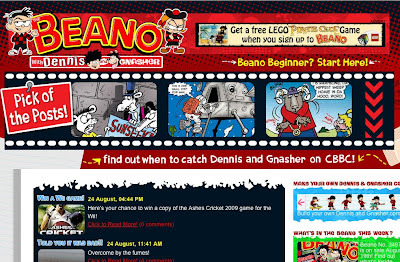 The Beano website has also had a makeover recently, with more inside info and other tweaks. 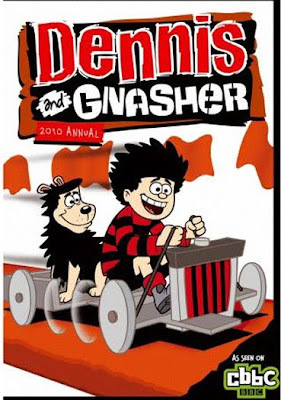 ...and the Dennis and Gnasher Annual 2010 will be in bookstores next week. What a shame none of the newspapers reported the positive aspects of the story: being proud of Dennis the Menace, a character that has endured for over 50 years by only making minor concessions to a changing society. 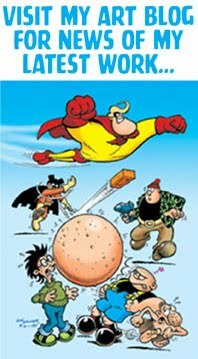 A British comics character that is once again crossing over into television instead of the other way around. 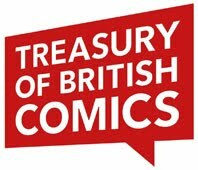 And perhaps, just perhaps, they might wish the tv series well and hope it boosts the sales of The Beano, - a long established British comic that those same traditionalists would be "horrified" to see go. Brilliant post, Lew - I've clearly been taken in by the Telegraph in particular. 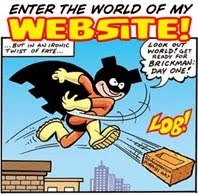 Have now updated my coverage to send people here (http://downthetubescomics.blogspot.com/2009/08/dennis-de-menacing-denounced.html). A great piece of research. Agh! Not you too John! Beware the Meeja for it can cloud men's minds. Thanks for the plug mate. Hope you're well. That really is a nasty example of lazy journalism spilling over into something far more damaging. I recall somebody mentioning that article in the office. Very misleading, and (perhaps more annoyingly) far more difficult to reverse in people's minds once they've read it. I'm glad I'm not the only person who is sick of reading these spurious 'it's political correctness gone mad' stories that seem to go completely unchallenged. The truth is, they'd be more horrified if he WAS shown being beaten by his Dad or a teacher - and rightly so. 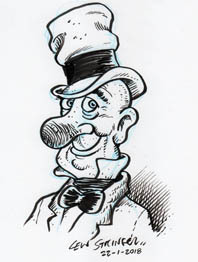 Newspapers have often used comics as a scapegoat for a any number of society's ills, stirring up the indignation of the ignorant. The trouble with that is that they never seem to research their subject matter and only put one side of the arguement (usually negative). Sadly, this doesn't just affect rants about comics these days, but is now xenophobic too. As you say, this new Dennis TV show is a chance for the Beano to get some well-earned publicity and that can only be a good thing for comics. By the way, the way I see it, Dennis actually looks more like Davy Law's Dennis (circa 1960s)with his longer legs, which is quite a surprise. Dennis wasnt slippered in the 1996 TV series and I doubt he has been slippered in the comic for over 10 years (feel free to correct me people) Ive seen some of the new stuff in animatic form its very good. Current Private Eye covered this too. And found that the Daily Mail had run a similar "Dennis gone PC!" story in 2008, the Sun in 2007, and the Sun in 2003. And I distinctly remember when I was a kiddie in the 90s, one of the papers run an article warning that there were Plans Afoot to PCify the Bash Street Kids. Clearly DC Thomson is constantly under siege! Yes the Bash Street Kids story was a ploy by Thomsons to get publicity. They changed the Kids for a couple of weeks, then changed them back. I think some papers were claiming they'd forced the rethink, but of course in reality those strips were all drawn weeks in advance and there was never any intention to change the characters permanently. I remember when I was a kid, for one issue Dennis exchanged his usual striped jersey for a tracksuit and walkman. Uproar! I think it was a different story I'm thinking of (there seem to be a lot of 'em about! ), but that's a great trick. They did that with Dennis in the late 80s as well, didn't they? "...for one issue Dennis exchanged his usual striped jersey for a tracksuit and walkman. Uproar!" 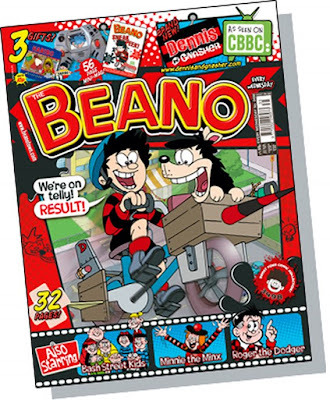 I'm a Yank and I got the Beano on import as a kid, after being "enlightened" to it by a transplanted Scots school friend. I still remember the day I received and opened that very issue in front of some non-British school pals. 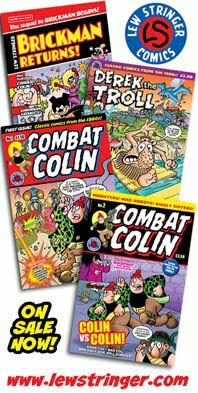 Before reading the story through and finding that Dennis didn't keep the modifications, I had a near-hallucinatory meltdown in front of my friends, all of whom had long predicted the Beano would drive me insane. Auto Assembly - this weekend! Toxic's best free gift ever?